Williamson's Sapsuckers breed in the mountains in Colorado and most apparently migrate south with all but a few birds reported in the state from Oct 1 to around April 1 when they start returning. 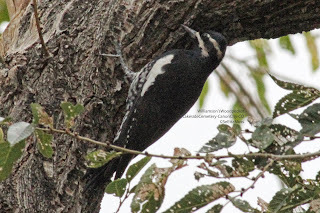 Some of those remaining in Colorado come into Canon City in the fall and remain over the winter along with a few Red-naped and Yellow-bellied Sapsuckers. I found this male and female Williamson's Sapsuckers, the first of the season, in Lakeside Cemetery. Though they briefly fed in the same tree and near each other, it did not last long as the female left the tree to the more dominant male. I have observed this previously with males being more dominant and chasing females away from their feeding location. 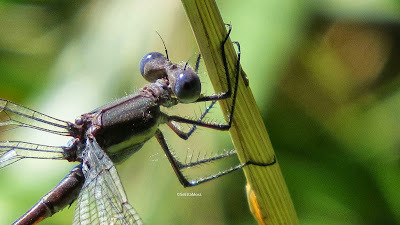 I found a good sized population of these damselflies near an irrigation pond in Canon City, CO. Linda Rockwell identified the species as Greater Spreadwinged Damselfly (Archilestes grandis). When I read about this species on SouthwestDragonflies.net the field marks matched though the "continuous pale yellow side stripe on thorax" as described looks whiter on this damselfly and it may be immature as they note. I thought it was a male because it's top appendage matched their description and drawing.